Holly Holm is all about making history. As a former multi-time boxing champion, Holm already set the standard for huge moments in women’s combat sports when she crossed over and became the second ever UFC women’s bantamweight champion with her knockout over Ronda Rousey. This weekend at UFC 219, Holm has the chance to make history again if she beats Cris Cyborg to win the women’s featherweight title as she would become the first woman in UFC history to hold championships in two different divisions. Doing things that have never been done before is part of the reason Holm got involved in sports in the first place, but as exciting as it would be to hold that honor after Saturday night, she promises that’s not her primary focus. “I want to do things in this world and in my life that haven’t been done before. If there’s no female that’s done it before, guess what? I want to do it,” Holm said ahead of her fight on Dec. 30. “That’s something that’s always driven me. I’m a driven person. That’s something that really drives me. Much like her win over Rousey back in 2015, Holm was obviously proud to become UFC champion but there’s something to be said about becoming the first person to ever hand the previously unbeaten former Olympian a loss. Back then, Rousey looked like an unstoppable force of nature that would roll through every contender the division had to offer until she finally decided to lay down the belt and walk away from the sport. Holm proved otherwise with her second round head kick knockout to finish Rousey and the same opportunity will be afforded to her this weekend. Cyborg has gone undefeated for more than a decade with resume of beaten and broken competitors who all tried to beat her with most being crushed by knockout long before the final bell. Once again, Holm will have the chance to become a champion but to be the person to finally topple the mighty Cris Cyborg would mean even more to her legacy. 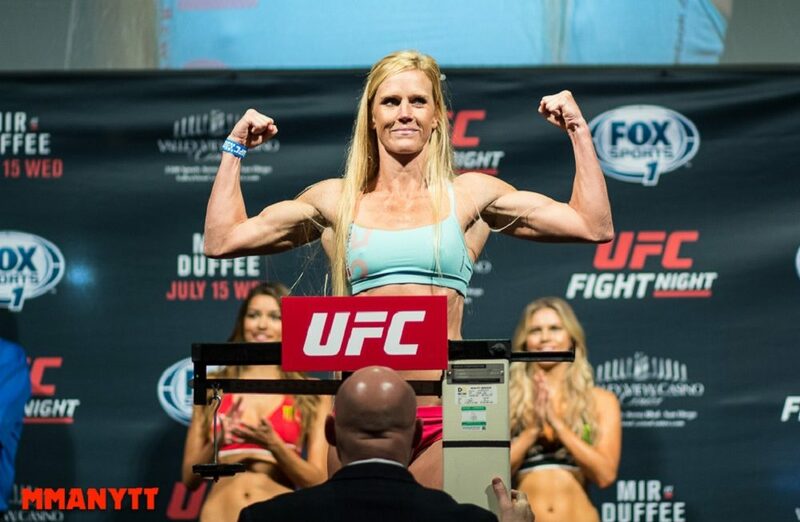 “Yes, I would love to be a two division champion but even more so by the time I get to the end of my career, I want to know that I’ve challenged myself and had wins over people that were really good,” Holm said. “That I didn’t just protect myself my whole career before I get to the end of it. You can be an undefeated fighter but if you never fought anybody good, can you really feel proud about it?